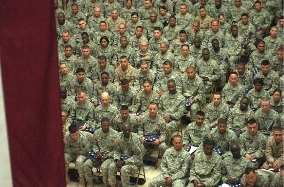 Our top story today showcases 259 service members in Iraq from 71 countries, become US citizens. There are still folks who believe that America is A-OK! There’s a great story out of Mosul, tracking and capturing a sniper, and Lightning Troop making friends with the citizens. Complex attack in Sadr City ends well. Iraqi Media Day in Baghdad offers a positive direction, that would be beneficial happening in our country. CAMP VICTORY – The largest US naturalization ceremony to be held overseas took place April 12 at the Al Faw palace here. 259 service members representing 71 countries held up their right hands and pledged their allegiance to the country which they already defend – thus becoming America’s newest citizens. Service members from across the Iraq theater of ops gathered at the palace to take part in the ceremony, representing the Army, Navy and Marines. The age group of the new Americans spans decades, with the youngest naturalized citizen being 19, the oldest 47. 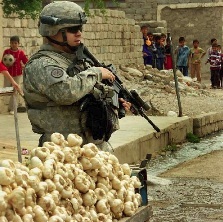 “My family doesn’t even know that I did this,” said Spc. 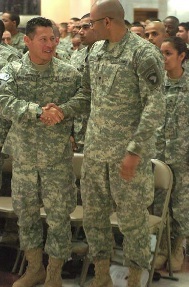 Jose L. Mandario with 3rd Sqdrn, 73rd Cav Regt, 1st BCT, 82nd Abn. Div. Mandario’s family originally emigrated from the Philippines and now resides in Long Beach, Calif. He plans to surprise them tonight with an email of his new citizenship certificate. “They will be very happy,” he said. Pvt. 1st Class Kareem Aktari of Lightning Troop, 3rd Sqdrn, 3rd Armored Cav Regt, advances on a sniper’s position, using a wall for cover, after coming under fire in western Mosul, April 10. Pvt. 1st Class Jared Bottorff and Sgt. Robert Johnson track a sniper as he moves from rooftop to rooftop. Pvt. 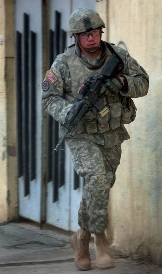 1st Class Anthony Humphries breaches a door while in pursuit of a sniper, as Pvt. 1st Class Jared Bottoff prepares to enter the building with the remainder of the squad. Pvt. 1st Class Jared Bottoff moves from room to room while clearing a structure during the pursuit of sniper that has just fired on his squad. 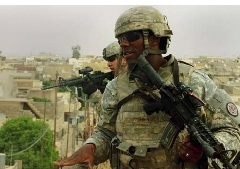 BAGHDAD – MND-Baghdad soldiers, in a combined op with IA soldiers, killed several criminals in eastern Baghdad after their convoy was attacked by multiple road side bombs, and small-arms fire from adjacent high rise buildings, April 11. 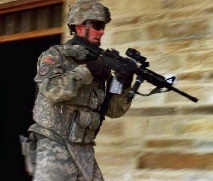 Soldiers from 1st CAB, 68th Armor Regt, 3rd BCT, 4th ID soldiers, supporting IA soldiers killed 2 criminal snipers, 2 criminals firing RPGs, and multiple others from a nearby building where soldiers were taking RPG and machine gun fire. immediately returned fire with 7.62mm and 25mm small arms, killing at least 4 Special Groups members. Secondary explosions were observed from the building immediately after, possibly indicating arms and munitions were stored in the building. 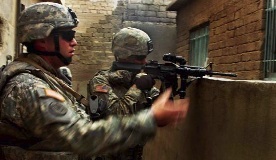 Small-arms fire continued to come from nearby buildings until 1st CAB, 68th AR engaged the buildings with 2 122mm rounds from a M1A2 Abrams tank, killing 2 criminals and ending the small-arms attack. Airmen assigned to HHC, 3rd BCT, operating an UAV recon platform identified 3 criminals emplacing additional IEDs. The UAV fired one Hellfire missile, killing all 3 criminals. 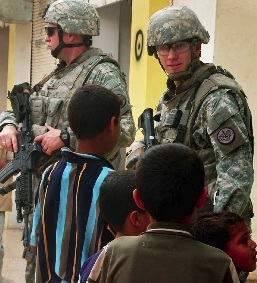 First Lt. Kyle Hoisington of Lightning Troop, 3rd Sqdrn, 3rd Armored Cav Regt and his interpreter, stop to speak to some young men during a presence patrol in the al-Zeira neighborhood of Mosul, April 10. 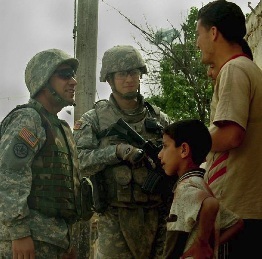 First Lt. Kyle Hoisington chats with some boys. Sgt. 1st Class Barry Taylor provides security for Hoisington. TIKRIT – The cmdr. of MND-North held a round table meeting with several major Iraqi media outlets in Bagdad, April 11. Maj. Gen. Mark P. Hertling, along with the Iraqi spokesman for the Baghdad Security plan, Tahseen Sheikhly, 9 broadcast, 4 print and 1 radio agency discussed security, economics and provincial govt development in northern Iraq. The event provided an opportunity for Iraqi media to coordinate future embed opportunities with CF in the area. “This was a great step in the development of relationships between Iraqi journalists and CF in northern Iraq,” said Maj. Peggy Kageleiry, spokesman for MND-N.
Habbaniyah – Marines of 2nd Bn 24th Marines, RCT 1 discovered 9 caches north of Habbaniyah, April 8, 2008. They included more than 29,000 small arms rounds, 170 mortar rounds and assorted fuses, 104 artillery rounds, 47 grenades, 86 rocket propelled launchers, 15 anti-personnel and tank mines and 2 SA-7 surface-to-air missiles. Also found at the sites were several compressed gas cylinders, 10 pounds of high explosives and an assortment of detonation cords, triggering devices, electrical blasting caps, fuses, primers and several cell phones. The sites also included more than 35 rockets, rocket launchers, igniters, propellants and several AK-47s with magazines and 50cal machine gun. “2nd Battalion 24th Marines brings a unique skill set to the fight, being reservists they apply knowledge from their civilian jobs to today’s battlefield. Numerous Marines in the battalion are law enforcement officials, they know how to work the streets. They know how to work with the local citizens. Finding this cache is an example of a well trained battalion working with the locals to accomplish the mission,” said Maj. Matthew Reid, current ops officer, RCT 1. TIKRIT – The Iraqi Department of Border Enforcement discovered a large weapons cache in the eastern desert of Diyala Province April 11, containing more than 100 anti-personnel mines as well as anti-tank mines and a 155mm projectile. The Iraqi DBE in northern Iraq contains more than 8,700 agents and covers 9 points of entry into the country. They also patrol the border and conduct other assigned law enforcement duties. BAGHDAD – Iraqi NP and MND-Center Soldiers on a joint op captured a key criminal in Jisr Diyala, April 11. The detainee is a known criminal leader in the area responsible for IED attacks, indirect fire attacks and weapons smuggling. This criminal is also suspected of recent violence in the area. TIKRIT – Iraqi Soldiers discovered 3 weapon caches of various munitions and explosives northeast of Kirkuk, April 10. The caches included 60mm Chinese mortars, 82mm Chinese mortars, 57mm Chinese projectiles, 120mm Chinese mortar high explosives, 60mm Iraqi mortars, more than 50 85mm Iraqi rocket motors, 105mm Iraqi projectiles, 40mm projected fuses, 130 Russian projectiles, Russian fuses and an 85mm Russian projectile. This is the third large cache found in this area within a week.